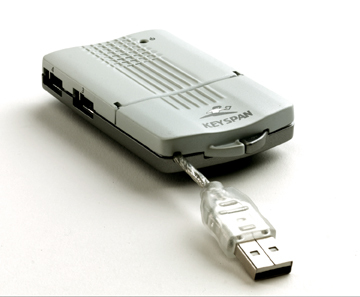 Keyspan (PC Expo #1204), America’s top selling brand of USB connectivity products, is now shipping a USB 2.0 PCI card for Windows and Mac OS computers. Distributed by Ingram Micro and Tech Data, the card is available now and has an MSRP of $59. 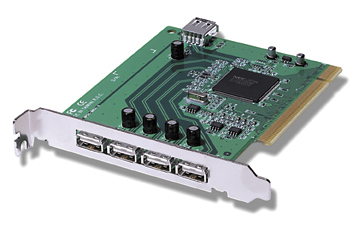 The Keyspan USB 2.0 PCI card adds five USB 2.0 ports to a PC or Macintosh. The card is ready for use with USB 2.0 peripherals that will come to market this summer and will operate at speeds up to 480 Mbps. The card also supports all USB 1.1 devices. USB 1.1 devices continue to operate at normal speeds (12 Mbps or 1.5 Mbps). Given Microsoft’s recent decision not to support USB 2.0 in Windows XP, are you confident that Microsoft will support USB 2.0 in time for your product to be successful? We think the confusing reports just did not deal with fact that getting XP GM was more important than USB 2.0 drivers. So it was a slow press day for some and they opened their mouths en masse. Is Apple giving positive signs about its adoption of USB 2.0 (especially considering Apple may have an interest in favouring FireWire)? We expect to hear from Apple on its stance on USB 2.0 this week during WWDC. Personally I think Apple is okay with it as long as it doesn’t cut into its investment in FireWire too deeply and too quickly. Can you highlight the benefits USB 2.0 has over FireWire? USB 2.0, at 40 times the speed of USB 1.0, is faster than FireWire; and has the ability to string other devices along the bus. Keyspan, America’s top selling brand of USB connectivity products, announced a USB hub that is just 1 cm thin, yet offers all the functionality of a desktop USB hub. Distributed by Ingram Micro and Tech Data, the Keyspan Mini USB Hub has an MSRP of $49 and will ship in July. If small, compact and unobtrusive are the features you look for in a USB hub, then this may be the one for you. Rip, Mix, Burn? What about Stomping them? Stomp, Inc., a leader in the development of innovative software and computer accessories, is pleased to offer the Click ’N Burn Macintosh, CD pre-mastering, recording and duplication software for anyone with a CD recorder who wants professional results. The powerful Click ’N Burn solution makes the process of burning and producing a CD quick, easy, and fun. Stomp, Inc. understands that its customers abilities to record what they want is often limited to the crippled recording software which came with their CD-R drive. Click ’N Burn Macintosh STOMPS on the competition. Among the many features that Click ’N Burn Macintosh offers are audio CD creation from MP3, SDII, AIFF and WAV files with no hard drive overhead, as well as flawless CD-to-CD copying, and data creation. In addition, Click ’N Burn Macintosh offers recording audio to the hard drive from sound cards line-in or microphone with audio scribe software. No CD recording software that is equipped with your computer comes with this many features. “We are very aware of the many frustrations users encounter with existing software packages. Click ’N Burn Macintosh users will have access to features that have never before been offered – and they’ll be able to use it right out of the box,” said Mike Hummell, President of Stomp, Inc.
Click ’N Burn Macintosh requires Power PC Macintosh or faster, 32 MB of RAM, a minimum of 10MB free hard disk space, and MacOS 8.0 or later. Click ’N Burn Macintosh retails for $49.99 and is available at retail outlets nationwide and online at www.clicknburn.com. So go ahead: Click, Burn, Stomp!